Crab & Fin Restaurant and Wagner Realty proudly presents “Holiday Night of Lights”. St. Armands is THE holiday destination, on the Gulf Coast of Florida, as the Circle magically comes to light and life with grace and elegance. 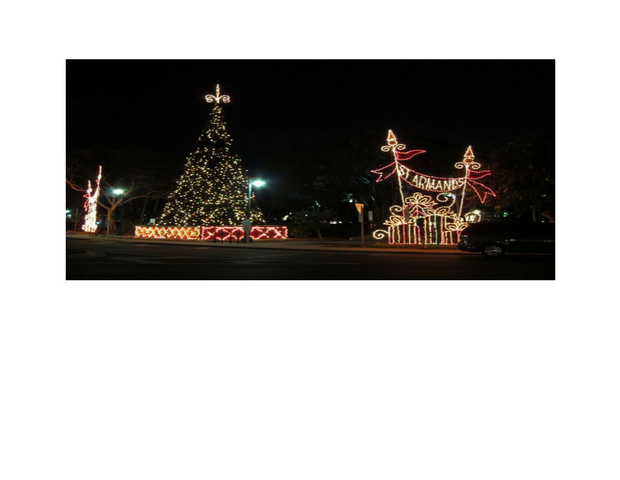 “Holiday Night of Lights” is St. Armands official “kick off” to the holiday season. The event begins with a special performance at 5:30 pm to 6:00 pm. Join in with our annual Christmas Carol Sing-a-long beginning at 6:00 pm, followed by “Santa’s Arrival” in his spectacular sleigh and our tree lighting ceremony. Photos with Santa are available throughout the evening from 6:30pm – 8:00pm. Enjoy holiday entertainment, special store promotions and gracious hospitality provided by our many shops and restaurants. We do recommend making your dinner Reservations, in advance, at our many fine Circle restaurants. A special evening for the young and the “young at heart”.